After living in England for a summer, I had a new found love for a particular portable food: the Cornish pasty. Whoever devised such a great way to use leftovers was certainly a savvy housewife. Tradition claims that the pasty was created as a way for tin miners to eat their lunch without having to return to the surface. 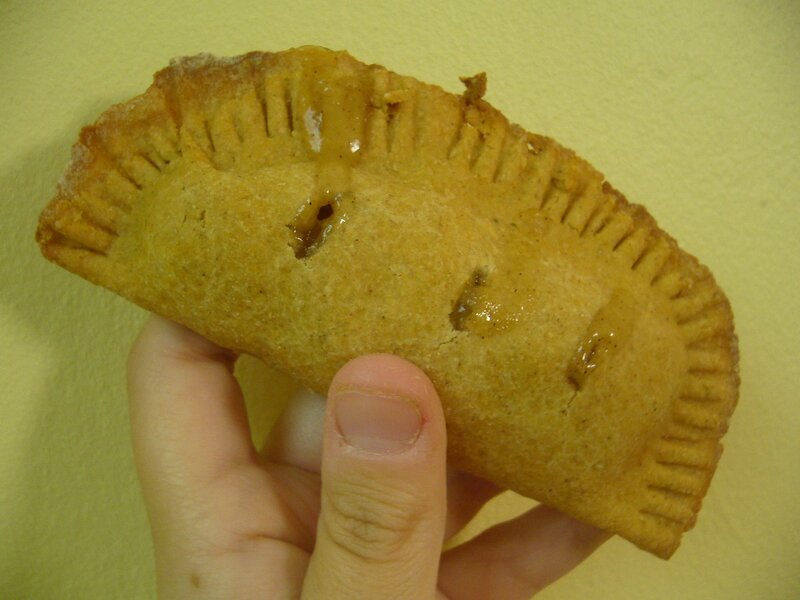 A simple device, the pasty is nothing more than dough with a filling inside that’s then folded over, sealed, and baked. The traditional filling includes diced steak, onion, and potatoes, but today’s modern pasties are filled with a variety of sweet and savory options. Combine all of the dry ingredients in a large mixing bowl. Using your fingertips or a pastry blender, cut in the shortening until the mixture has the consistency of cornmeal. Add the milk and mix until everything comes together. Turn the dough out onto a floured board and knead 10-20 times. If it is too sticky to knead, add a small amount of pastry flour. Roll the dough out to about ½ inch thickness and cut out rounds using a 2 inch biscuit cutter. The dough should yield about ten of them. Roll each round out to about 5-6 inches in diameter and stack them (with wax paper in between) in the refrigerator for at least an hour. I just used some that I made last night, so it does keep overnight as long as it’s covered and cool. Now it’s time to contemplate filling. I was really hankering for apple-cinnamon so I used some apple pie filling that I canned last fall. I’d recommend using homemade or all-fruit preserves and fillings as often as possible simply because it helps control the sugar content better. You could even use unsweetened applesauce and add some spices for a similar flavor. The possibilities are endless. Replace the vanilla protein powdered with unflavored for savory pies. Try a spoonful of leftover chili or some pizza sauce, cheese and finely diced pepperoni. Once the dough rounds have chilled, mix together one egg and 2 tsp. of water. This egg wash will help seal the pies and keep them from coming apart in the oven. Place one heaping spoonful of filling on one half of the round. Do not overfill—it will make a mess in the oven. With your fingertip, paint egg wash around the edges of the same side. Fold over the other half of the dough, pressing gently to remove any excess air. Crimp the edges with a fork to seal. Using a paring knife or kitchen shears, pierce 3 small vent holes in the top of each pie. Bake the pies in a 350 degree oven for 20-25 minutes. Keep an eye on them after about 20 because soy flour browns very quickly. Yum! Each dough round is 125 calories, 5 grams of fat, 13 grams of carbohydrates, and 7.5 grams of protein. The final product will depend on the filling you choose. With my apple pie filling, the total was about 150 calories. I had one at tea today and warmed it up for a minute in our toaster—it was heavenly. Wrapped in plastic wrap, fruit pies will keep for about a week. Meat pies should be refrigerated. For long-term storage, place the unbaked pies on a cookie sheet in the freezer. Once they’re frozen, put them in Ziploc bags and store. They can go straight from the freezer to the oven, but will take slightly longer to cook, maybe about 30 minutes. So there are the pies, as promised. I hope you have a chance to enjoy making them, because they make a great quick lunch or snack. As for me it’s back to reading for school, so ciao for now friends! ← Save Room, (later tonight) There’s Pie! Mmmm… sounds yummy. Also sounds like a way for me to make more healthy “hot pockets” style snacks for my kids. I could see using pizza sauce, kraft free mozzarella and pepperonis! Thanks for the recipe. I am going to try this and I still have to try your apple cake.